GL RFCA has a remit to raise awareness of veterans welfare support and help direct veterans to the many charities and service providers who can help meet their needs. Our close relationships with London Boroughs and communities means we are frequently being made aware of events, opportunities and initiatives that may affect veterans. 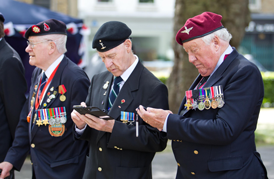 Using our database of all Veterans’ Associations in London we are able to provide timely and relevant information to London’s veterans. We also provide office accommodation for SSAFA at seven sites across London, helping them to provide direct support to veterans.